1955. The leafy perfume of tobacco hung on Durham’s dark night air. 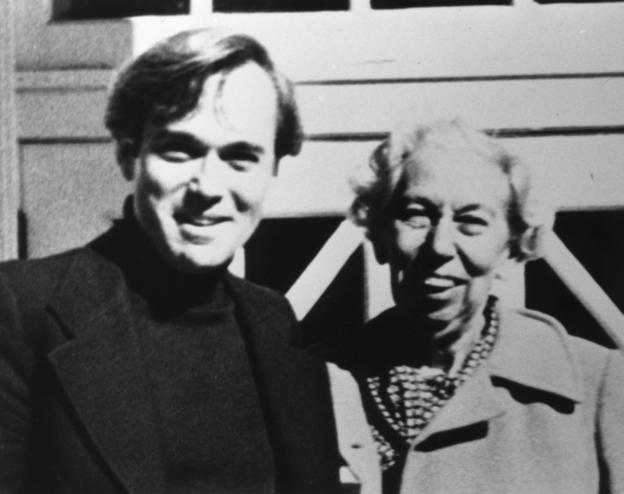 It was after midnight, and Reynolds Price had taken it upon himself to pick up Ms. Welty, who was coming to give a lecture at Duke Women’s College. The lecture two days later would be titled “Place in Fiction” — but that night at the train station, Price did not yet have a place in fiction. He was a Duke senior with one scrappy short story to his name, an inkling for narrative, and a crush on Ms. Welty — a literary crush. I’m sure his heart rate spiked and his palms grew sweaty as she stepped down off the train in those clunky mary-janes she wore. During her three day visit to Duke, she generously agreed to read his story, then asked if she could share it with her agent. “Could she?” Price loved to say when retelling this story, his honed- marble voice steeped in delight and gratitude. Fifty-six years later, Price has written more than 30 books — novels, short stories, plays, essays, Gospels and memoir, including his last, Ardent Spirits: Leaving Home, Coming Back. His death two weeks ago has sent me to my bookshelves, reading through his short stories, revisiting Kate Vaiden, tasting his wisdom in the NPR-aired commentaries collected in Feasting the Heart. As a student at Duke, I spent hours in the library’s Rare Book Room reading Price’s papers, pondering elegant handwritten margin notes on his manuscripts, looking for clues on how the mind of a writer works, how the magic happens. I never had the nerve to take his classes, but only idolized him from afar, part literary crush, part lionized father-figure (he and my father were classmates at Duke, my dad the dashing football player and fraternity boy, he the debonair writing student and Rhodes Scholar. Despite my dad’s claims, I doubt they really knew each other). Only once at a literature conference years later, did I muster the nerve to go up to him, express my admiration and introduce myself, my voice shaky, my palms damp. In Ardent Spirits and elsewhere, Price shares that his motto is: “I’ll only regret my economies.” He lived a splurged life. He spent his artistic gift and said “keep the change.” He indulged in friendship, in teaching, in renegade faith, in beauty, in pain. He inhabited his wheelchair like a throne and wore scarves around his neck like a clerical stole. His voice was deep and resonant, his stories dense, his turn-of-phrase poetic, heavy and occasionally pretentious, his classroom reputation intimidating, his gentle and frequent smile was knowing and broad. I regret many economies — including the chintzy ego that shied away from his class. As a student still, however, I intend to learn from his fiction and his life. My latest discovery: that Price was perhaps the first significant American novelist to have a top 40 pop hit. Yes, my literary crush co-wrote two songs with my musical love — James Taylor : the top 40 “Copperline” and the lesser known, New Hymn. Listen to two of North Carolina’s most beautiful, lyrical voices. ~ by Stephanie on 02/06/2011. I missed that he died and I appreciate the post Stephanie. He too was one of my favorite authors. I remember loving Blue Calhoun and will re-read. I’m sure his words will probably mean something different to me these many years later but will still have the power to touch me in a new way. Perhaps his example will inspire greater bravery for both of us but you already inspire me with yours! Wow! I didn’t know that he’d done some music with James Taylor! I still remember the incredulity I felt when I read Kate Vaiden — how perfectly he captured a female voice.